OKLAHOMA CITY • Stephen Curry will get the chance to make up for one of the few disappointments of his career today, when the Golden State Warriors take on Oklahoma City Thunder in Game Seven of the National Basketball Association's Western Conference finals. Curry, who became the first unanimous winner of the NBA's Most Valuable Player award when he picked up the highest individual honour for a second straight season, lost his only previous appearance in a Game Seven in 2014. The Warriors were beaten 126-121 by the Los Angeles Clippers in the first round of that year's play-offs, with Curry scoring 33 points. "I've been in one so far in my career and it didn't turn out the way we wanted it to," Curry said. "We have another opportunity to get the job done on Monday." On Saturday, Curry bagged 29 points but his performance was overshadowed by that of his back- court mate Klay Thompson, who scored 41 in the Warriors' 108-101 win in Oklahoma City that sent the best-of-seven series to a decider. "We've got a lot of belief and a lot of heart, and we've given ourselves a chance to win this series," said Curry, who scored just nine in the first half. If we thought tonight was hard, Game 7's going to be even tougher. Everybody on both sides of the ball is going to leave it all out on the floor. It's win or go home. So we can't expect just because we're at home that we can just show up and win. STEPHEN CURRY, Warriors guard, on preparing for their deciding tie against the Thunder in the NBA Eastern Conference finals. "That's all we could ask for. There's obviously a lot of excitement, but we still have one job to do." After falling behind 3-1 in the series against the Thunder, the Warriors now have history on their side. Home teams are 100-24 in Game Sevens. "It's going to be a hard game," Curry said. "If we thought tonight was hard, Game Seven's going to be even tougher. Everybody on both sides of the ball is going to leave it all out on the floor. It's win or go home. "So we can't expect just because we're at home that we can just show up and win." On Saturday, amid the steady drum beat of an arena rooting for him to fail, Thompson refused to let the Warriors fade away. With his team facing elimination from the play-offs for the second time in three nights, he sank 11 of 18 three-point attempts, while Curry added 29 points, 10 rebounds and nine assists. "I'm so proud of everybody," Thompson said. "We were down almost the whole game. We never gave up and our resiliency got us through. We kept our composure. We knew if we didn't get it done we were going home." The Thunder, who were 3 of 23 from three-point range, took an eight-point lead into the fourth quarter and kept trying to build on it. But Thompson refused to let them pull away. His fourth three-pointer of the quarter cut Oklahoma City's lead to four. 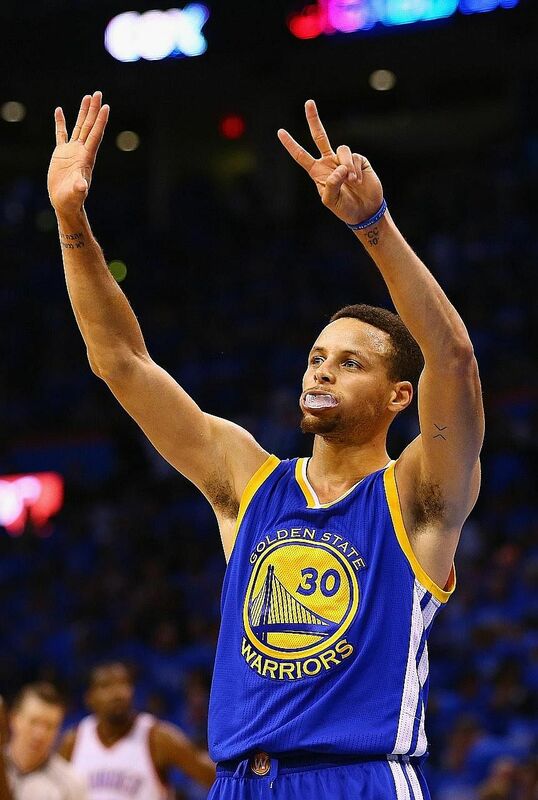 Curry later drained back-to-back three-pointers to tie the game, 99-99. "We didn't draw a whole lot up that created shots for them," coach Steve Kerr said of Thompson and Curry. "They were mostly just kind of playing the way they play." With less than two minutes to play, the Warriors' Andre Iguodala stripped Russell Westbrook of the ball, which found its way to Thompson in a comfortable spot, behind the three-point line. It might as well have been a lay-up. The Warriors were up by three points, and the crowd fell silent. Later, after the Thunder had forced a rare miss by Thompson, they threw the ball away. The Warriors' Draymond Green scored to seal the victory. The game was an all-consuming nightmare for the Thunder's Kevin Durant and Westbrook. Durant finished with 29 points but shot just 10 of 31 from the field. Westbrook was only marginally more accurate, scoring 28 points while shooting 10 of 27. The winners of Game 7 will advance to the NBA Finals, facing the LeBron James-led Cleveland Cavaliers when the best-of-seven championship series opens on Thursday. But, after squandering a 3-1 series lead by botching a golden chance to advance at home, the Thunder must win on a court where the Warriors have lost only twice all season. "We can't hang our heads. We have another game to play," Westbrook said. "Win or go home. Simple as that."